There are 2 main types of age-related macular degeneration: dry (atrophic) AMD and wet (exudative) AMD. The type of AMD is defined by how the damage at the macula occurs. It is important to distinguish between the types of AMD because it will influence the treatments that you receive. Note: Having dry or wet AMD has nothing to do with dry eyes or watery eyes! Dry age-related macular degeneration is the more common type of AMD. As the cell death that occurs in dry AMD develops very slowly, any change to your central vision will also occur gradually over time. In dry AMD, the cone photoreceptors cells at the macula essentially just degenerate and 'die'. There may be accumulation of waste products (drusen) at the macula but there is no growth of abnormal blood vessels. The disruption to the central vision is due to cell death and not due to the accumulation of blood or fluid. Unfortunately, there is no treatment that is able to effectively stop this atrophic degeneration process. Dry AMD usually takes a number of years to reach its final degenerative stage (geographic atrophy). At this point, the dry AMD causes a blank patch in the central vision in both of your eyes. In those who have had wet AMD for a long time, severe scarring can occur at the macula (disciform scar). When this happens, the wet AMD is considered to have "dried up". This means that there are no new abnormal blood vessels growing and that your macula has been badly scarred. 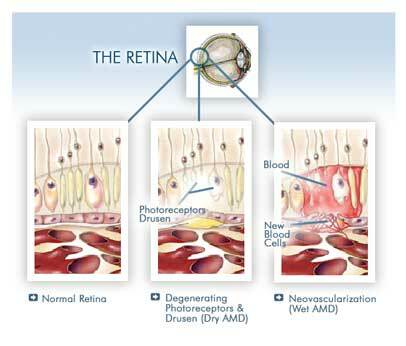 Wet age-related macular degeneration occurs in about 10-15% of people who develop AMD. In wet AMD, the cells of the macula stop working correctly and in response, the eye starts growing new blood vessels to fix the problem. Unfortunately, these blood vessels grow in the wrong place and cause problems by leaking fluid and blood at the macula. This growth of abnormal new blood vessels (choroidal neovascularization / CNV) causes more damage to your cells and eventually leads to scarring at the macula (disciform scar). In wet age-related macular degeneration, choroidal neovascularization (CNV) leaks out fluid, blood and protein at the macula. This causes the structure of the macula to become distorted and swollen, thereby disrupting the function of the cone photoreceptors. As a result, central vision loss from wet AMD develops rapidly. Wet AMD can develop very quickly, causing significant deterioration to your central vision within a short period of time. This is due to the accumulation of fluid, blood or protein, which disrupts the normal functioning of the cone photoreceptor cells at the macula. The good news is that AMD treatment is now available for the wet type of AMD, which stops the abnormal new blood vessels from growing and damaging the macula. This treatment involves injecting an anti-vascular endothelial growth factor (anti-VEGF) drug into the vitreous cavity of the eyeball. 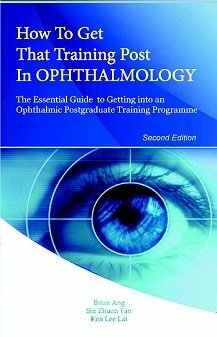 However, speed is of the essence - treatment needs to be given quickly before too much damage has been inflicted on your macula. If the abnormal new blood vessels are left to grow unchecked, such as what happened in the past without anti-VEGF treatment, the scarring and the central vision loss it causes is permanent. The picture on the left shows a severe case of wet AMD, where there is a huge amount of blood at the macula. The picture on the right shows disciform scarring, which is a consequence of the wet AMD. Although there are no more abnormal new blood vessels or blood at the macula, the central vision remains permanently lost due to the severe scarring. Unfortunately, anti-VEGF treament for these other types has not shown results that are as good as with treatment for choroidal neovascularization. HOW DO YOU DIFFERENTIATE BETWEEN DRY AND WET AMD? Your ophthalmologist will need to look at your macula through a dilated pupil. Often, your ophthalmologist can tell you whether you have age-related macular degeneration or not from this examination. However, you may need to undergo extra tests to find out for certain if you have AMD or to find out whether you have wet or dry AMD. 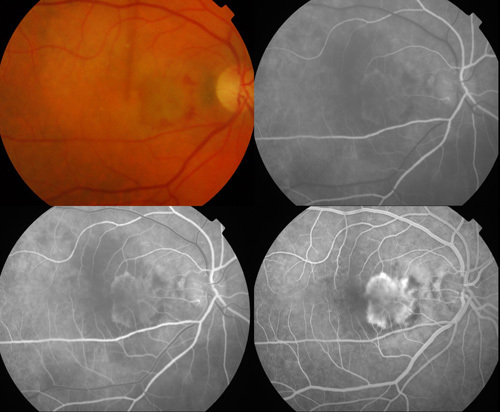 There are 2 main tests: optical coherence tomography (OCT) and fluorescein angiography. Blood and protein accmulation at the macula from wet AMD is relatively easy to see on examination. However, fluid accumulation can be subtle and difficult to detect. 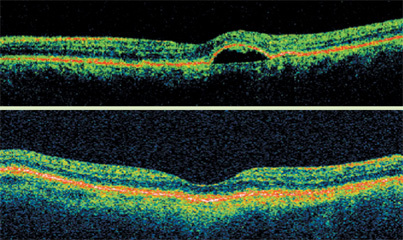 Optical coherence tomography (OCT) is a scan that enables the detection of fluid at the macula. With the newer OCT scanning machines, even the slightest amount of fluid or other material at the macula can be picked up with great accuracy. If fluid is seen on OCT scanning, then you are likely to have wet AMD. Top: OCT showing a small pocket of fluid, with elevation of the macula. Bottom: OCT of a normal macula, howing a smooth contour with no bumps or elevations. The fluorescein angiogram test confirms your AMD and determines whether you have wet or dry AMD. 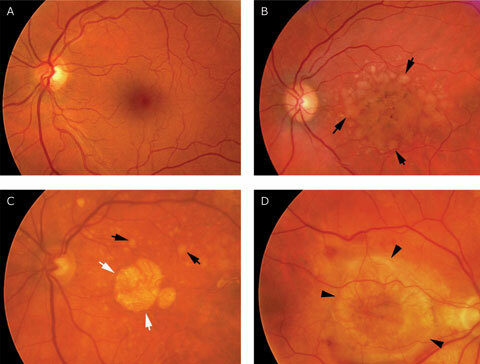 Usually the network of abnormal blood vessels at the macula cannot be seen just by clinical examination. Your ophthalmologist will be able to see the damage to your macula but not the detail of the abnormal blood vessels. Having a fluorescein angiogram is a way of taking pictures of these abnormal blood vessels. It involves the injection of a yellow eye (fluorescein) into a vein in your arm. This fluorescein dye travels through your bloodstream to your eye and makes the abnormal blood vessels visible on the pictures taken. Once the dye is injected, you will be asked to look at a special camera. The camera takes pictures of the macula and retina as the dye travels through the blood vessels in the eye. There will be a series of flashing lights as the pictures are taken. The whole process usually takes about 10 minutes. The picture on the top left shows a choroidal neovascularization in wet AMD. The pictures on the top right, bottom left and bottom right show typical fluorescein angiogram appearances of the abnormal blood vessels (seen as the progressively whitening patch). This is a very common test and very few people have any serious side effects. You may feel a bit sick as the fluorescein dye travels in your bloodstream. Your skin may become slightly yellow from the dye. Your urine may also appear a darker yellow than normal for up to 3 days. Some people are dazzled for a while after the flashing lights but most people find the test straightforward and painless. Results from the OCT and fluorescein angiogram tests will tell you what type of age-related macular degeneration that you have. They will also help to determine if your AMD is suitable for treatment. Regardless of the type of AMD, remember that early detection and treatment is important for the best outcomes. You can monitor for symptoms of macular degeneration with an Amsler grid. As soon as you suspect that you may have symptoms of macular degeneration, consult your ophthalmologist immediately for further evaluation.